Plum Granny Farm Weekly Update -- Welcome November! Posted 11/6/2015 10:04am by Cheryl Ferguson. November brings two challenges for farmers. The first is the end of daylight savings time -- even though it happens every year, it does always seem to catch us by surprise when it is getting dark at 5 p.m.! But we do not stand still on rainy, cloudy days -- we are getting our seed ready to go for planting. We have a nice batch of seed garlic this year -- most of it is ours but we did order some from other organic farms. Our final order of seed garlic came in this week -- got some beautiful, big bulbs and BB inspected each one! And speaking of BB, she has finally passed the magic 30-pound mark which signals when we will start weaning her. Today's weight is 31.6 pounds! BB is also transitioning to becoming an outdoor lamb. Ray has been working on a shelter for her-- a simple Quonset-hut style that will be covered with a tarp. The fencing arrived yesterday and she is starting to get used to the whole idea of NOT touching the fence - that might take a while. She will also be getting a companion in addition to Brix - her brother will come to live with us in the next week or so! We are getting really excited about our 2nd Annual Small Business Saturday event here at the farm on Saturday, November 28 from 10-4. We have our list of vendors finalized and it's a great line-up: Greenberries Farm, Jewelry by Wonder/Tree of Life Crafts, MW Herbs, Truffles NC, Farmgirl Arts and Rail Fence Farm. Even Gesti is getting in the spirit for the event! Help Wanted! We are looking for a few volunteers to help us put new plastic on our greenhouse. We anticipate taking care of that task on Thursday, November 19 in the morning. If you are interested in helping, send us a note at farm@plumgrannyfarm.com. We need about 10 people for a couple of hours. We had a great time at Cobblestone Halloween last week -- we even decided to go in costume! And we had a great visitor at our tent -- a beautiful Golden Retriever with the same costume idea as us! Even though the weather forecast isn't great for tomorrow, we will be at Cobblestone Farmers Market at Old Salem on Saturday (9-noon). Our tables will be brimming with goodness! We'll have even more Sweet Potatoes (Garnet, Covington, Sweetie Pie and Stokes Purple). There will be lots of greens (Senposai, Kale, Swiss Chard, Pac Choy, & Tatsoi) for your stir-fry and salads. We'll also have Salad Mix and Friseé. In the garlic department, we are restocked with Garlic Powder & Granules and have garlic sampler bags and still have good supply of most of our garlic -- although some varieties are running out. We are getting near the end of the crop for our Baby Ginger. There will also be Green Beans, Kohlrabi, Fresh & Roasted Green Chile, and Aji Dulce (sweet habanero) peppers -- all Certified Organic. And don't forget our tasty jam -- Old Fashioned Raspberry is back! Come on out and support your local farmers! We are happy to hold an item for you -- just let us know no later than 9 p.m. Friday evening. On Wednesday, please take a moment to remember our veterans and say a word of thanks. Both Ray and Cheryl's fathers were part of the Greatest Generation, serving their country during World War II. We owe a huge debt of gratitude to all of our veterans. Thank you for your service! Plum Granny Farm Weekly Update -- All Treats, No Tricks! Posted 10/30/2015 9:39am by Cheryl Ferguson. And Happy Halloween Eve! Your farmers won't be out trick or treating tomorrow but we are getting ready for a scary good market for you! More details below! We had a pretty good rainfall this week -- 1.25 inches -- so things rehydrated and settled in. And Brix got her curls back. Knowing that the rain was coming, on Monday we prepped the area for the shallots. We removed the remaining grass, added fertilizer and lots of leaves. Ray was able to get out on Tuesday morning to form the beds -- just in time before the rain began to dump. Now the beds are all ready for planting shallots. We added more French Red shallots to our seed order this year so hope to have a bigger crop in 2016! After the rain, Chris and Amy tackled the older strawberry field to clear out the weeds and the old leaves and runners. Check out the before and after shots -- Great job, guys! We had a great time yesterday at Old Salem Museum and Gardens talking to a group of about 30 garlic lovers on how to grow garlic at home. Thanks so much to Vonnie Hannah for making this possible! We have a VERY limited amount of seed garlic available. If you are interested, please email us and we can bring it to market. We will not be bringing seed garlic to market for general sales. BB is turning into quite a young lady. Today's weight is 29.6 pounds! And as she edges near the 30 pound mark, she is closer to weaning. Yep, these bottle days are coming to an end, girl! She got her ear tag this week (required of all sheep and goats through the National Scrapie Eradication Program, coordinated by the U.S. Department of Agriculture’s Animal and Plant Health Inspection Service.) Scrapie is a terrible disease similar to mad-cow. It is a fatal, degenerative disease affecting the central nervous system of sheep and goats for which there is no cure or treatment. BB is now enrolled in this tracking program and has the pink tag to prove it! Plans are firming up for our 2nd Annual Small Business Saturday event here at the farm on Saturday, November 28 from 10-4. Once again we are teaming with our friends at Buffalo Creek Farm and Creamery for the event. We have 4 vendors confirmed and are working on a couple more. Stay tuned for more information! Looks like we'll have a nice day for market tomorrow! We will be at Cobblestone Farmers Market at Old Salem on Saturday (9-noon). Lots of delights of the season on our table. Our fresh, Organic Baby Ginger is looking really good and is available. You'll be able to see a sample of our Baby Turmeric -- it isn't available for sale yet because we want it to grow out a bit more before full harvest in mid-November. We'll have the first of the Sweet Potatoes - we have 4 varieties: Garnet, Covington, Sweetie Pie and Stokes Purple. There will be lots of greens (Senposai, Kale, Swiss Chard, Pac Choy, & Tatsoi) for your stir-fry and salads. We'll also have Salad Mix and Friseé. We are restocked with Music Garlic Powder and have a good number of packets of Garlic Granules. We have a new mixture in our culinary garlic sampler bags and still have good stock of most of our garlic -- although some varieties are running out. We'll also have Green Beans, Kohlrabi, Tomato Fruit Boxes, Fresh & Roasted Green Chile, Aji Dulce (sweet habanero) peppers, and a wee bit of Okra -- all Certified Organic. And don't forget our tasty jam! Happy Halloween -- be safe out there! Posted 10/23/2015 10:05am by Cheryl Ferguson. We had an early visit last weekend from our friend, Jack. Yes, Jack Frost planned his fall trip to the farm a bit earlier than in the past several years. We have been a bit lucky because frost hasn't really hit until later in November for the past 3 years but the dice rolled up a frost last Saturday morning. Three mornings of frost and a low of 31 really knocked down some plants -- the tomatoes (pictured above) have very few leaves anymore. It will be a while to see the complete impact -- warmer temperatures may help us stretch out the harvest a bit longer. It's funny how some plants are so much more frost tolerant -- the sunflowers just keep on smiling! The frost gave us a good excuse to dig the sweet potatoes. Wow, what a harvest! We got over 720 pounds of the prettiest sweets we've ever grown! This year we have 4 varieties: Garnet, Covington, Sweetie Pie and Stokes Purple. They will start coming to market next week -- the sugars really develop once you let them cure, so they are warming themselves in the greenhouse. Get your recipes ready! We've been busy selling our seed garlic and helping others learn about growing one of our favorite crops. We donated seed to the Stokes Extension Master Gardeners Volunteers' SEED Garden in King. Cheryl taught them about planting and helped get their bed ready for winter. And the garlic from the Workshop here at the farm has started to emerge! Don't forget we will be doing a lunchtime talk on growing garlic at Old Salem Visitors Center on Thursday, October 29 at noon as part of the Old Salem Horticulture workshop series. The session is free and attendees may bring a lunch; beverages are provided. To pre-register, please email vhannah@oldsalem.org or call 336-721-7357. Maybe BB stands for Bigger and Bushier! Today's weight is 27.5 pounds! Perhaps all of the sweet potato vines she ate helped this week! We are working on plans for our 2nd Annual Small Business Saturday event here at the farm on Saturday, November 28. We'll have more vendors than last year and hope to have a few surprises! More to come! Looks like a another good week ahead for market weather! We will be at Cobblestone Farmers Market at Old Salem on Saturday (9-noon) and at the LAST of the season King Farmers Market at the YMCA on Wednesday (11-1). For those of you who have been asking -- our Garlic Powder and Granules are BACK!! Also in the garlic department, we are taking orders for seed garlic and have our popular culinary garlic sampler bags. We still have lots of greens -- Senposai (a Japanese hybrid of cabbage and komatsuna), Kale, Pac Choy, & Tatsoi for your stir-fry. We'll also have Salad Mix and Friseé. There are still a good number of green beans (Jade round pod, haricot verts, Romano, and beautiful cream & purple-streaked Dragon Tongue), winter squash, kohlrabi, tasty Muscadines and Scuppernong Grapes, Baby Ginger, Tomato Fruit Boxes, Fresh & Roasted Green Chile, and Aji Dulce (sweet habanero) peppers -- all Certified Organic. And don't forget our 6 varieties of jam -- just made a batch of Old Fashioned Blackberry this week! Posted 10/16/2015 9:42am by Cheryl Ferguson. I love October. Maybe because it's my birth month, but I think it is mostly because the days are so beautiful. The air is clear and crisp and the sky can be a deep, piercing blue. October's beauty is a wake-up call to me to enjoy the colors and smells of this special time of year -- enjoy it before it fades into winter's cold and grey. It's garlic planting time! We had a great time on Sunday at our Garlic Growing Workshop here at the farm. Twelve folks came out and explored the wonders of garlic and then got to plant some! We will be doing an abbreviated version of this talk at Old Salem Visitors Center on Thursday, October 29 at noon as part of the Old Salem Horticulture workshop series. The session is free and attendees may bring a lunch; beverages are provided. To pre-register, please email vhannah@oldsalem.org or call 336-721-7357. BB seems to be on a steady growth pattern, gaining about 3 pounds per week. Today's weight is 24 pounds! This week BB got to go back to visit Farmer Laura and BB's twin brother, Abernathy. We were expecting a grand reunion with lots of play -- but not so much! It is obvious that BB has been with dogs and people a lot more than she has been with sheep. Looks like a good week ahead for market weather! We will be at Cobblestone Farmers Market at Old Salem on Saturday (9-noon) and at the King Farmers Market at the YMCA on Wednesday (11-1). New this week is powdered turmeric! We will still have lots of green on the table. Try some Senposai -- a Japanese hybrid of cabbage and komatsuna -- or Kale, Pac Choy, or Tatsoi for your stir-fry. We'll also have Salad Mix and Friseé. There are lots of green beans (Jade round pod, haricot verts, Rattlesnake pole, Romano, and beautiful cream & purple-streaked Dragon Tongue), tasty Muscadines and Scuppernong Grapes, lots of cured garlic along with Baby Ginger, Tomato Fruit Boxes, Roasted Green Chile, and a few Summer Squash, Snow Peas, Aji Dulce (sweet habanero) peppers and Shishito Peppers -- all Certified Organic. And don't forget our 6 varieties of jam! Today is Dictionary Day in honor of Mr. Noah Webster's birthday. What new word will you learn today? Posted 10/9/2015 8:55am by Cheryl Ferguson. What a difference a week makes! We have had a gorgeous week here at the farm -- such a pleasant change from last week's bluster. By the time the storm rode out of town, we had about 5.5 inches of rain -- still nothing like some of our fellow farmers did, but it was a lot. Thank you all so much for understanding our decision last week to not be at Cobblestone Farmers Market -- given the way the rain and wind persisted, we know we made the right decision! We have tried to take full advantage of the sunny, warm weather. A major task has been to get the strawberries cleared and ready for winter and to plug in some of the holes. We got the larger field finished this week -- yay!! Special thanks goes to Chris who finished up the task on Wednesday! And sometimes you get rewarded for your work! Here's Amy enjoying a fall strawberry. Another task was to get the drip tape out of the potato fields so that we can get them prepped for garlic. Have you ever tried to roll up drip tape with help from a lamb? Speaking of BB, today's weight is 21 pounds! She has decided that Gesti is part of the herd and has begun to teach this poor dog sheep etiquette (Gesti thinks it needs to be the other way around). We are back to normal with markets this week -- we will be at Cobblestone Farmers Market at Old Salem on Saturday (9-noon) and at the King Farmers Market at the YMCA on Wednesday (11-1). And JAM is back! We have restocked and have Old Fashioned Raspberry, Raspberry-Baby Ginger, Raspberry-Chipotle, Raspberry-Cranberry, Baby Ginger-Strawberry-Mint and a special edition Blackberry Caramel Jam! There will be lots of green on the table. 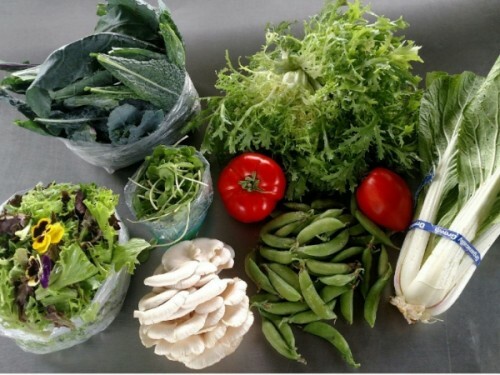 We'll be bringing a new green to market this week -- Senposai -- a Japanese hybrid of cabbage and komatsuna. It is like a tender, sweeter collard - give it a try! It will be joined by Kale, Swiss Chard, Pac Choy, Tatsoi, Salad Mix, and Friseé. We still have lots of green beans (Jade round pod, haricot verts, Rattlesnake pole, Romano-type, and beautiful cream & purple-streaked Dragon Tongue), tasty Muscadines and Scuppernong Grapes, lots of cured garlic along with Baby Ginger, Okra, Summer Squash, Tomato Fruit Boxes, Roasted Green Chile, Cucumbers, and a few Snow Peas, Aji Dulce (sweet habanero) peppers and Shishito Peppers -- all Certified Organic. Tomorrow is National Angel Food Cake Day! Enjoy -- perhaps with a bit of ...jam? Posted 10/2/2015 11:25am by Cheryl Ferguson. Let's get the main news out of the way first -- we will not be at Cobblestone Farmers Market tomorrow. With a predicted storm and especially the accompanying wind, we feel that it is wise to not be there. We feel that the risk for our products, tents, and especially our customers just isn't worth it. As of now, the market is scheduled to go on as usual but that may change. To know the latest about the market, check out their Facebook Page. It's another windy, chilly and rainy day here at the farm. The wind has been howling all night and a constant mist has been swirling all morning. We've had nearly 3.5 inches of rain since last Thursday and it sounds like there is a good chance of a couple more inches before this thing is past us. Our rain totals aren't as high as some of our fellow farmers -- In Season Gardens in Danbury had over 5 inches as of Wednesday and Ridgecrest Farm in Lawsonville had over 7". Lots of water! WXII-TV was interested in hearing about the impact of the rain on farmers, so they came up and interviewed us for last night's news. Thanks to Veronica White for visiting us! We've already heard from a few of you that you saw it! The rain is definitely having an impact on the crops -- development of bean pods and okra has slowed a lot and we are starting to see mold on squash plants. We keep on trudging out into the field in our rain gear and picking away! Several crops are still pouring in -- we harvested over 50 pounds of muscadines and scuppernongs yesterday and today! We finally were able to get to Camp Hanes to make some jam! 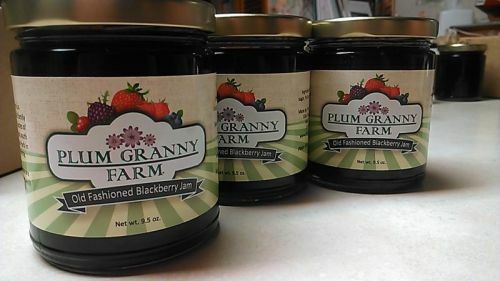 It was good timing with the rain -- Cheryl brushed off her jam-making skills and replenished our stocks! We now have Old Fashioned Raspberry, Raspberry-Baby Ginger, Raspberry-Chipotle, Baby Ginger-Strawberry-Mint and a special edition Blackberry Caramel Jam! So for those of you who have been waiting, come and get it! Today's weigh-in: 18.5 pounds! Her new favorites are snow peas and sugar snap peas -- vines, flowers, peas...yum! And she and her kitten friend have become roommates -- the kitten is in a crate next to BB in the living room (the house is starting to feel like a barn!). BB is a very comforting and calming influence on the kitten -- it has begun taking food from our hands! The kitten will soon be moving to its new home with Chris & Summer! BB is innately curious and finds all kinds of things to explore -- she found the soap suds from the drain when we were washing buckets the other day! A few more slots remain for our hands-on garlic growing workshop here at the farm on Sunday, October 11 from 2-5. If you are interested, get your registration in soon! Attendance is limited to 15 people. Again, we WON'T be at Cobblestone Farmers Market at Old Salem on Saturday (9-noon). We WILL be at King Farmers Market at the YMCA on Wednesday (11-1). We'll have lots of green beans (Jade round pod, haricot verts, Rattlesnake pole, Romano-type, and beautiful cream & purple-streaked Dragon Tongue), tasty Muscadines and Scuppernong Grapes, lots of cured garlic along with Okra, Salad Mix, Summer Squash, Roasted Green Chile, Pickling Cucumbers, Kale, Swiss Chard, Snow Peas (few) and Shishito Peppers (few)-- all Certified Organic. And don't forget the JAMS! Plum Granny Farm Weekly Update -- Welcome Fall! Posted 9/25/2015 10:58am by Cheryl Ferguson. Welcome to Autumn! It seems that she packed her bags with clouds and rain -- of the past 6 days, 5 have been either cloudy or rainy! It has been nice this summer to not have to worry about the rain interfering with harvest, plowing or other farm tasks. Yes, the drought has been hard -- our pond is at its lowest level in quite some time -- but continuous sunny days have been delightful! But for now, we'll don our rain gear and do what needs to be done. 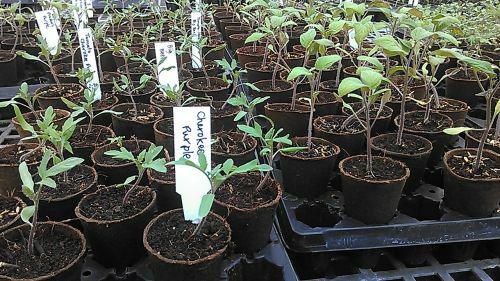 The cloudy, rainy days have been a boon for planting. Got more lettuce and chard planted in Flat Shoals and will be adding more kale early next week. The harvest drum continues its beat too -- beans, beans & beans! We are also starting to get the first of the pickling cucumbers in as well as some snow peas. We started an early harvest of the ginger and turmeric today. We had hoped to take both to market this week but the turmeric just isn't ready yet. We did get some nice white and yellow baby ginger and we'll have that on our tables this week! Our little lamb keeps growing! She weighed in at 16 lbs. this morning -- little fat piggy! She is developing her browsing instincts and is quite fond of ivy (yes, little lambs DO eat ivy!) and bean plants. BB has a new friend as well. A feral kitten appeared in the yard on Sunday night and we were able to get it sheltered in a crate. This kitten (gender still unknown) is incredibly wild but it seems to really like BB. The lion (cub) will lay down with the lamb, I guess! Given tomorrow's weather forecast, BB will NOT be at Cobblestone. She is now on an 8-hour feeding schedule so she can be at the farm while we are at market. Don't worry, we will bring her back to Cobblestone at least once more to Laura Frazier's FarmGirl Arts booth! Just two more weeks until our hands-on garlic growing workshop here at the farm on Sunday, October 11 from 2-5. We've had lots of interest in the event so get your registration in soon! Attendance is limited to 15 people. We'll be at Cobblestone Farmers Market at Old Salem on Saturday (9-noon) and King Farmers Market at the YMCA on Wednesday (11-1). With the forecast of rain for Saturday, we won't have our roaster but we will have samples of our veggie green chile stew to warm you up! If you buy a bag of chile, we'll give you the recipe. We'll also have lots of green beans (Jade round pod, haricot verts, Rattlesnake pole, Romano-type, and beautiful cream & purple-streaked Dragon Tongue - pictured below). This will be the last week for our tasty Muscadines and Scuppernong Grapes. We will also have lots of cured garlic along with Okra, Salad Mix, Summer Squash, Roasted Green Chile, Pickling Cucumbers, Tomatoes (Fruit Boxes and a few slicers and paste tomatoes), Kale, Swiss Chard, Snow Peas (few) and Shishito Peppers (few)-- all Certified Organic. Plum Granny Farm Weekly Update - A Taste of Fall & Pirates Galore! Posted 9/18/2015 9:40am by Cheryl Ferguson. The first hints of Fall abound -- occasional red leaves on trees, dogwood berries, shorter days and a definite nip in the air! Sweatshirts and quilts came out of hiding earlier this week -- the low on Sunday night was a chilly 44 degrees! The official start to Fall begins at 4:21 a.m. on Wednesday -- it's the autumnal equinox. Lots of fall preparations are underway. Cutting hay and readying the strawberry field are high on our list of priorities. Hay making this fall is a bit more important since we need some ourselves -- we've got 2 hungry critters to feed this winter! For our strawberries, we are cleaning up the plants that went in last fall and are filling the empty holes from our plant shortage last year. Ray ran the bushhog over the field to give the plants a haircut and now we face a very time-consuming task of removing the runners and plant debris. Ray estimates that it will take about 20 labor-hours to do this. Then we'll use the plants that we started from runner tips to fill-in any holes. Harvest continues to occupy a lot of our time with the beans pouring in along with muscadines, okra and squash. Our planned bean successions seem to be working well with the first of the 2nd planting showing up on our market tables this weekend. And the long-anticipated green chile is starting to roll in! The roaster is in full production! Mmmmmm! Our tiny little lamb isn't so tiny. She weighed in at 13 lbs. this morning (we actually thought that she'd hit 15 for sure!). BB and Gesti are doing very well together and the cats don't view her as dinner anymore. BB will at Cobblestone for a few more Saturdays at Laura Frazier's FarmGirl Arts booth at the top of the Cobblestone Old Salem Market. Stop by and say "hi" to BB and Laura! Don't forget our upcoming hands-on garlic growing workshop here at the farm on Sunday, October 11 from 2-5. We've had lots of interest in the event so get your registration in soon! We are limiting attendance to 15 people. The workshop will provide extensive information on garlic growing as well as an opportunity to plant garlic in a raised bed. In addition to instruction, participants will receive 1/2 pound of seed garlic. Registration and prepayment is required. Cost of the course is $30. Please email us at farm@plumgrannyfarm.com for a registration form. We'll be at Cobblestone Farmers Market at Old Salem on Saturday (9-noon) and King Farmers Market at the YMCA on Wednesday (11-1). We'll have lots of green beans (Jade round pod, haricot verts, Romano-type, Rattlesnake pole). There will also be bunches of our tasty Muscadines and Scuppernong Grapes! Click here for a copy of the Scuppernong/Muscadine Grape Hull Pie recipe from Our State -- it's a Southern classic! We will also have lots of cured garlic along with Okra, Salad Mix, Summer Squash, Roasted Green Chile, Tomatoes (Fruit Boxes and a few Saladettes, slicers and paste tomatoes) and Shishito Peppers (few)-- all Certified Organic. Ahoy matey! Tomorrow is one of our favorite wacky holidays -- International Talk Like a Pirate Day! Practice up your "pirate-speak" in anticipation. Don't worry if your eye-patch is at the cleaners - you don't have to dress like a pirate, just talk like one. Aargh! Plum Granny Farm Weekly Update -- Beans A'Plenty! Posted 9/11/2015 9:01am by Cheryl Ferguson. Aren't sunflowers the most cheerful of flowers? How can you look at them and not smile? These big beauties are the sunflowers that our young visitors planted during the Farm Tour in July. From seed to 7' blooming plant in 2 months -- amazing. More amazing things are happening on the farm as well. Our big bean harvest last week was quickly overshadowed by the ENORMOUS harvest this week! On Monday alone, we harvested over 115 pounds and yesterday we got another 60! And there's more to pick today. Guess what we'll have on our table at market?! Our Flat Shoals field is looking really good with the successions of beans rolling in. The winter squash plants are beginning to set fruit - so keep your fingers crossed. Here's a baby "Nutterbutter" Butternut squash. Ray has been taking care of a few construction projects over the past few weeks. One of the most exciting (for Cheryl anyway) is the work he has done on the wash line at the Tobacco Barn. It is important to have a place to wash and pack produce that is clean, comfortable and efficient. Sometimes it takes a while to figure out exactly what you need and what you want in a space. After doing this for a while, we now have a better idea of what the wash line should look like and Ray has been working his carpentry and plumbing magic to make it so! Washing lettuce for salad mix is SO much easier now!! What a week for BB! She has had a great time exploring lots of things -- garlic, peppers, beans, more garlic and Gesti. This kid is getting BIG! Today's weigh-in clocked her at 10 lbs. 9 oz. The feeding schedule is a bit more manageable (not every 3 hours anymore!). Her meeting with Gesti went very well -- lots of sniffing and interest on both of their parts. Here's hoping that they can be buddies! BB will be back at Cobblestone on Saturday at Laura Frazier's FarmGirl Arts booth at the top of the Cobblestone Old Salem Market. Stop by and say "hi" to BB and Laura! It's time to think about planting garlic! We will be offering a hands-on garlic growing workshop here at the farm on Sunday, October 11 from 2-5. The workshop will provide extensive information on garlic growing as well as an opportunity to plant garlic in a raised bed. In addition to instruction, participants will receive 1/2 pound of seed garlic. Class size is limited to 15 participants and registration and prepayment is required. Cost of the course is $30. Please email us at farm@plumgrannyfarm.com for a registration form. We'll be at Cobblestone Farmers Market at Old Salem on Saturday (9-noon) and King Farmers Market at the YMCA on Wednesday (11-1). We'll have lots of green beans (Jade round pod, french filet, Romano-type, Rattlesnake pole). We will also have lots of cured garlic along with Shishito Peppers, Okra, Salad Mix, Summer Squash, Muscadines, Tomatoes (Fruit Boxes, Saladettes and paste tomatoes), some Tomatillos, and Roasted Green Chile (small amount) -- all Certified Organic. Wishing a Happy New Year to our friends celebrating Rosh Hashanah beginning on Sunday! Posted 9/4/2015 9:14am by Cheryl Ferguson. The calendar has turned to September and there is a lot to smile about here at the farm! The crops we have planted for fall harvest are doing very well. We are getting more seeds and plants into the ground and are trying to stay on top of the weeds. Plus a few construction projects to round things out. Something we are very excited about are BEANS! Last Friday, there were only a few tiny green beans but on Monday, Ray's field check revealed bunches of them! We picked over 30 pounds in our first harvest. So... you'll find beans, beans & more beans at our tent on Saturday! This is the first of 4 successions of beans so we hope to have them through frost! Okra, squash and peppers are starting to come in more steadily as well. We are starting to get the first of the chile peppers and have pulled out the roaster -- rumor has it that it may be at market soon! This year we planted several New Mexican chiles -- Joe E. Parker, Big Jim, and Chimayo in addition to Ancho. The plants are on plastic mulch to try to control the water (our normal rainy summers really diminish the chiles' flavor and heat). Our plan worked well -- the chile is much more flavorful and productive than before. Next year we'll just have to get more plants in the ground! Our little lamb is growing and is doing very well. She is transitioning from unsure and timid to curious and more bold. Now she darts out ahead of "Mom" (whoever happens to be walking with her) and has started spronging around like a pronghorn antelope (it's just like a cartoon!). BB added almost 2 pounds to her little frame this week (official weight: 7 lbs. 9 oz.)! She's meeting lots of people and even got a chance to sniff out her soon-to-be bodyguard, Brix. It will be a while before she and the cats are introduced -- she looks a bit too much like prey right now. If you didn't get a chance to meet BB last week at Cobblestone, she'll be there again at Laura Frazier's FarmGirl Arts booth at the top of the Cobblestone Old Salem Market. Stop by and say "hi" to BB and Laura! We'll be at Cobblestone Farmers Market at Old Salem on Saturday (9-noon) and King Farmers Market at the YMCA on Wednesday (11-1). We'll have lots of green beans (Jade round pod, french filet, Romano-type). Our Garlic Scape Pesto was a hit last week and sold out -- but we made more! We will also have lots of cured garlic (Red Toch, Music, Purple Italian, Lorz Italian and Lahontan along with Elephant Garlic), Tomatoes (Fruit Boxes, Saladettes, slicers and paste tomatoes), along with Shishito Peppers, Okra, Salad Mix, Tomatillos, Summer Squash, Roasted Green Chile, Muscadines and the last of the French Red Shallots -- all Certified Organic. This week we say farewell to Matt McLaughlin, who has been interning with us this season. Matt is a student in the Sustainable Agriculture Program at Surry Community College and will be transferring to NC A&T upon completion of the 2-year program this spring. He is starting his own farm just down the road from us, Sauratown Hopyard and Farm. Matt has been a great asset to us in all elements of our work from seeding to planting to packing for market. Good luck, Matt! We hope you'll be back for garlic planting!